Unfortunately there are no shuttle buses from the airport to Queens or Brooklyn. It is very difficult to give good advice as this depends on where your accommodation is located in these areas. You can often get to your hotel/apartment by means of the subway, this is then often the cheapest way. You can find a subway map here. Another option is to take a Yellow cab at the airport. Depending on where you need to be, this shouldn’t cost more than $30 or $40. This price is for up to three people. If you are travelling with more people, taking a pre-booked van is a better option. You can do so by following these steps. You can book a van with a driver for up to six people and in doing so you will know the exact costs before you leave. Do you want to arrange your transportation to Brooklyn? 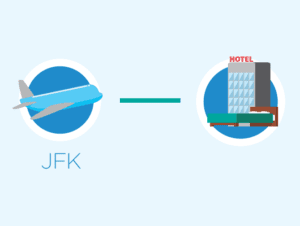 Then you can also book this private transfer from JFK Airport. Don’t forget to book the transfer back to the airport here.